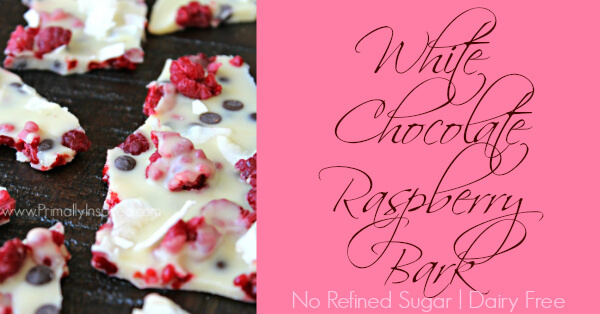 Here’s an easy white chocolate raspberry bark recipe featuring fresh raspberries, real honey & divine cocoa butter! 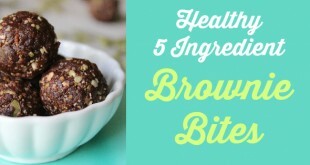 Dairy Free, No Refined Sugar and Paleo friendly recipe. If you’ve never experienced pure, unrefined cocoa butter (not to be confused with coconut butter) you are in for the treat of your life. Not only is cocoa butter one of the best moisturizers for your skin and exceptional for anti-aging and skin health (great for eczema and psoriasis, too! ), but you can also cook and bake the most glorious white chocolate flavored things with it! It’s pure bliss. Just a little FYI – If you’re going to get cocoa butter, there’s a few things you should know. Definitely make sure it’s food grade. And then I’d recommend getting a high quality one. The lesser qualities will taste a bit waxy if you decide to eat it. I’ve been extremely pleased with THIS cocoa butter. After I got done making my White Chocolate Lotion Bars (and I seriously almost took a bite out of the dang lotion bar it smelled so good), I knew I wanted to try to make my own white chocolate. 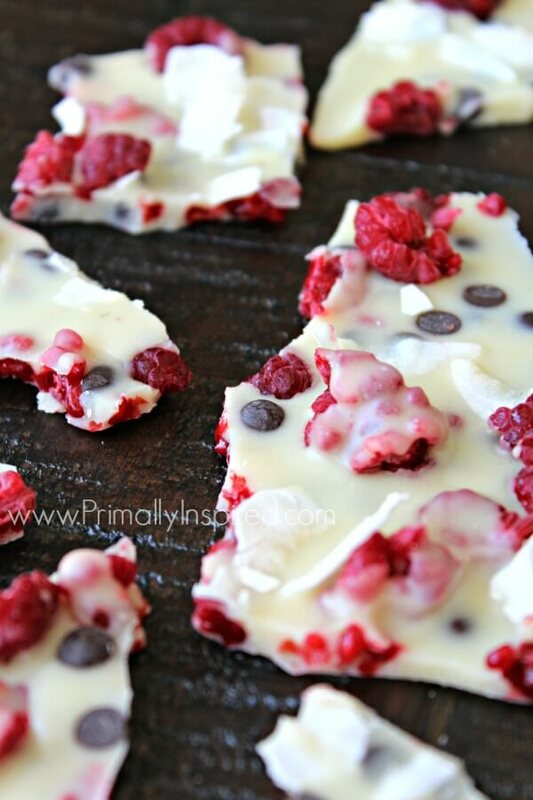 There’s just something about white chocolate and raspberries that I love. It’s a wonderful combination, don’t you think? 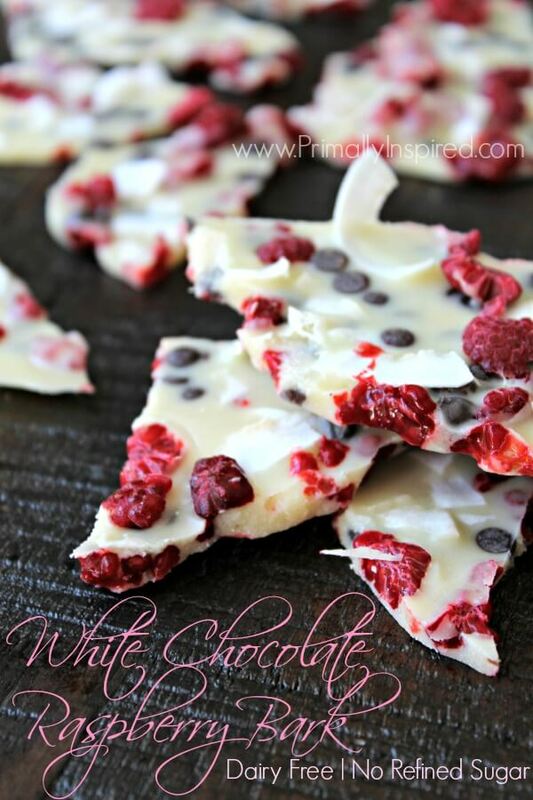 This white chocolate raspberry bark is no exception. The white chocolate is smooth and creamy and then you’ll bite into a piece with a raspberry and you’ll get a fun pop of juiciness and sweetness. 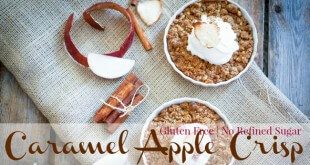 It’s a delightful treat for the taste buds! I think it’s such a beautiful treat, too – the contrasting colors are just so pretty to me! And just one piece is all you need to hit the spot 🙂 Enjoy! 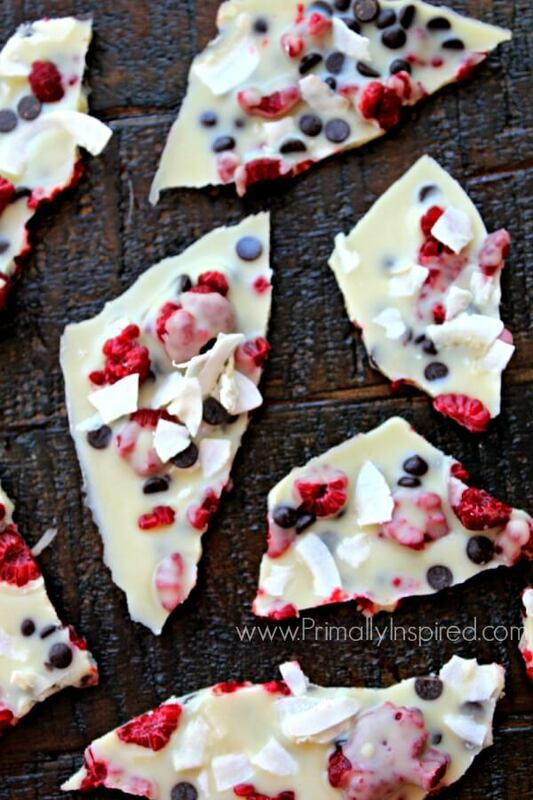 White Chocolate Raspberry Bark featuring fresh raspberries, cocoa butter and real honey! Add a few inches of water to a skillet over medium heat. Add your cocoa butter to a wide mouth, heat proof glass jar and place in the skillet. Allow to completely melt (takes about 5 minutes). Once the cocoa butter is melted, remove your jar from the heat and add to it your coconut oil, honey, vanilla extract and sea salt. Stir until combined. The mixture will be a light caramel color, but don't worry! As it hardens, it will turn light ivory. Using an immersion blender blend for a full 30 seconds on high speed. 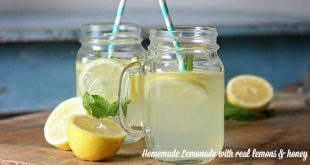 This is a critical step in the process because the ingredients will separate when chilled if it's not blended extremely thoroughly. I use THIS immersion blender. If you do not have an immersion/hand blender, you can use an electric mixer or a blender/food processor. Add ½ cup of raspberries and ¼ cup of mini chocolate chips to the bottom of a parchment lined 8x8 baking pan. Pour your thoroughly blended cocoa butter mixture all over the raspberries and chocolate, making sure to coat the entire bottom of the pan. Add any additional optional toppings now. I like to add 1 or 2 additional tablespoons of raspberries, chocolate chips and shredded coconut. Place the pan in the fridge or freezer to harden (only takes about 5-10 minutes). Once hardened, break into pieces. Enjoy! Keep any leftovers in the freezer. Want to make something else with cocoa butter? 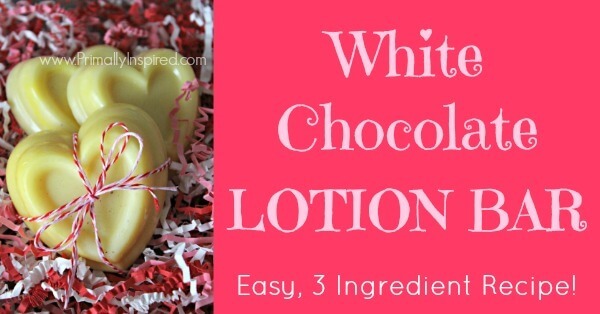 Try my easy White Chocolate Lotion Bar Recipe! You’ll love it! Oh my goodness! I just ordered all of the ingredients you listed. So excited, this bark is too beautiful to eat!…but I will.